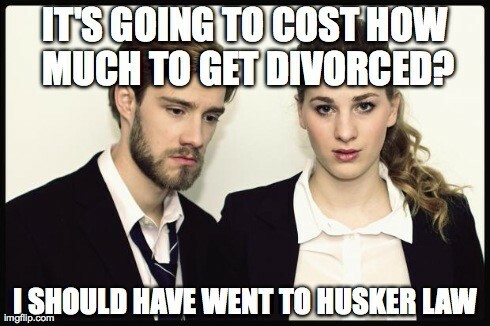 Husker Law offers a flat rate on most uncontested divorces. We offer a flat-rate retainer of $600 for most uncontested divorces without children, rather than paying a down payment retainer on attorney fees and then continuing to pay hourly. If you have children, then your case will require more work; the flat rate for cases with children is $850. These rates apply in the majority of uncontested divorce cases. The flat rate includes all necessary pleadings from start to finish. Specifically it includes the drafting and filing of the Complaint; drafting and filing of the Voluntary Appearance; letter to your spouse with the pleadings, preparation and drafting of the parenting plan (if minor children), drafting of the Stipulated Decree, and drafting and submission of the Certification, when appropriate. Flat rates do not include certified copies of the final Decree. However, you can easily obtain a certified copy of the decree should you find it necessary. There are still other costs associated with divorce. Even in an an uncontested divorce you may have to pay for mediation and/or a co-parenting class. Further, you will have to pay a filing fee to the Court. In Nebraska, it costs $157 to file a divorce action. In Iowa, the cost is $235. We are proud to be able to offer the flat rate fee to our clients. We feel as if offering this rate actually promotes more collaborative divorces, reduces conflict and does not threaten your financial stability. In a flat rate case you have all of the security of being represented by a quality law firm, without the insecurity of mounting legal fees. To know for sure if your case qualifies for the uncontested flat rate fee, just set up your free initial consultation.